Q: Do Sheriff's deputies have authority within the municipalities? A: The Sheriff has jurisdiction throughout Charleston County, but deputies normally do not respond to routine, non-emergency calls for service within the jurisdictions of municipal law enforcement agencies. Sheriff's Office deputies will assist other law enforcement agencies upon request and will respond to situations within the County when deemed necessary to ensure public safety. The Sheriff's Office does engage in certain routine activities such as civil process, detention and warrants on a countywide basis. The Sheriff has the authority to enforce state law throughout the County, including incorporated areas. Deputies do not have the authority to enforce a city ordinance within the limits of the municipality unless that ordinance has been adopted as a County ordinance. Q: I'm confused about jurisdiction. How do I know who to call when I have an emergency? A: When you call 9-1-1 during an emergency, your call is automatically directed to the appropriate law enforcement agency for your area. Q: Have all of the inmates at the Detention Center been convicted of a crime? A: No, the center accommodates a variety of inmate classifications, including pre-trail detainees. Q: Why have I seen inmates moving about freely in County buildings? 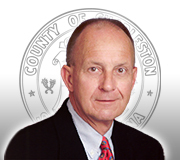 A: Inmates at the Charleston County Detention Center are classified by various categories. Those who meet certain criteria are allowed to work on County-sanctioned work projects under the supervision of Sheriff's Office personnel. Work project inmates are under incarceration for nonviolent crimes and usually have specialized skills useful for County work projects. Inmates wear a variety of uniform items to designate their status and the type of work to be performed, but all are clearly identified as Detention Center inmates. A: FOIA stands for the South Carolina Freedom of Information Act, which was enacted to provide direct access to the functions of government to the general public and press. Q: Do I have to file a formal FOI request to get information? A: Before filing a formal FOIA request, you may want to call or visit the public first and ask for the information you’re seeking. A formal FOI request may not be needed. If one is required, your request must be in writing. Q: Is there a fee associated with a FOI request? A: Generally speaking there is a fee that the public bodies are allowed to charge under FOIA. This fee may vary depending on the type of the request. A fee may be charge not to exceed the actual cost of searching for and making copies. Q: If I am a victim in case, will I be charge a fee to obtain a copy of an incident report? Q: How many days are allowed before my FOI request requires a response from the public body? A: Each public body, upon written request, have fifteen days (excluding Saturdays, Sundays, and legal public holidays) to respond to your request. Q: Can the public body charge an hourly rate for research? A: Yes. There is nothing under this Act that prevents the public body from charging an hourly rate, but it has to be a reasonable rate..